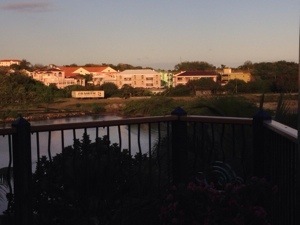 First Taste of Grenada | College is……..
Today will officially be my 4th day on the island of Grenada! So far, it’s a beautiful place. 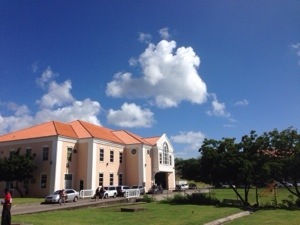 The school overlooks the ocean and my dorm room is only a couple steps from the Grand Anse Beach. It’s taken me awhile to adjust to the time change and island because I’ve never been to a school this big. All I can say is, SGU is exactly like the pictures! My first couple days on the island was spent tracking down my lost luggage and attending orientation sessions. I’ve never lost my luggage on a flight, but surprisingly (not so surprising for locals) my luggage was left behind in my short flight from Trinidad to Grenada. Next time, I would recommend not taking a layover or just packing really light. The plane was overbooked so there was a huge backup with luggage. On my flight alone, there were almost 20 people that didn’t have their luggage. Luckily I had a small carry-on with most of my necessities. My dad came to Grenada also to help me move in. He stayed at the True Blue Bay Inn which I highly recommend for other vacationers. The hotel has a nice restaurant that is right on the dock. All the rooms are also unique as they have many different sizes and they are cottage style. Just be careful of the birds, they will attack any unattended food here! While at True Blue Bay, I learned how to take the shuttle offered to SGU students. 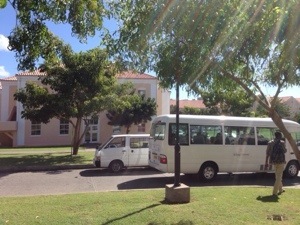 There are a couple different routes that the SGU shuttle takes, one of them is to my dorm at Grand Anse. These buses come at different times, but they are usually pretty packed. So far, I’ve pretty much only learned to take the shuttle to and from school. Orientation has also just ended. There were many different “mandatory sessions” each filled with students from your class. Our sessions went about 1-2 hours each and by the end people just started picking and choosing sessions that would be helpful to them. I didn’t attend all of them because living off the main campus, it’s a hassle to wait around for 4 hours. 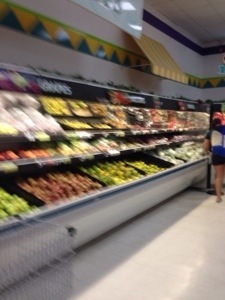 I instead used my time to look at the various shops in the area. All in all, I found the shops to be a bit pricier than US stores, but that is to be expected. 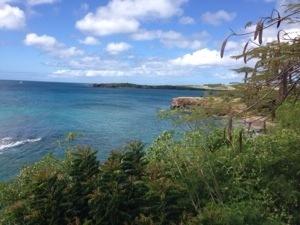 Grenada uses EC currency so the exchange rate is about 1US to 2.6EC. This makes buying items a bit difficult, but almost all stores I’ve seen takes either US dollars or credit card. My room does not have american plugs so I had to buy many different gadgets to switch from 240V to 110V. Overall, there’s still lots of exploring to be done. I haven’t even seen 3/4 of the island yet, but school starts Monday! 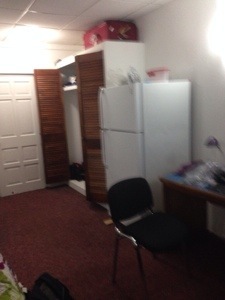 This entry was posted in Uncategorized and tagged caribean medical school, grenada, SGU. Bookmark the permalink. Hi! Congrats on passing! I’m actually starting the ftm program in August! Do you happen to have pictures of your dorm on Grande anse? I’m just trying to figure out how much storage I will have for packing purposes. Thanks so much!